"Buddha Shakyamuni gave the 35 Buddhas Sutra as the most effective and expedient method for purifying negativities and accumulating merit. The practice was very widespread in Buddhist India, especially during the time when the Mahayana and Vajrayana the paths of the Bodhisattva were flourishing there. 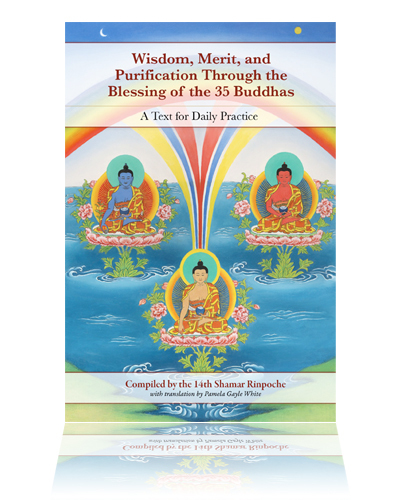 Many Buddhists tantric yogis, scholars, monks and nuns, householder practitioners chose this sutra among all the available Mahayana sutras and tantras as their preliminary practice or daily practice. Indeed, the great Tibetan master Marpa Lhodrakpa and a number of his peers chose it as their preliminary practice before focusing on the advanced practices of the Vajrayana. Just as all negative actions leave an imprint in the mindstream that blocks positive karma from ripening and reinforces the illusion of samsara, the merit generated by this practice blocks negative karma from ripening and sets us firmly on the path of liberation."